Greetings from the white tundra. If you are currently in the heartland you are likely looking out your window wondering if someone just shook the snow globe you’ve been living in. The back breaking fluffy stuff is officially blanketing our driveways and travel-ways. Fortunately, this is nothing new for those of us choosing to live in Illinois where are motto is “Our state might be completely broke, but at least we get all four seasons!” Everyone knows that the best thing to do in a snow storm is to go birding … well, birding in my den that is. In a glass half full perspective (probably with ice), a large backlog comes in handy on days like this. On this snowy day, I bring you Mr.200 from the warm confines of Texas. Now that is a beautiful bird. I came across it in the nick of time while visiting the South Padre Island Birding and Nature Center. Should be no surprise for my regular readers, but just in case, Linda and I were visiting down there in January of 2017. A shockingly short time ago based on my usual delay in getting my pictures processed and posted here. I was heading back to the visitor center after a fruitful day birding at the center. It was my second time there that day and it was getting late and wanted to get back to Linda who was keeping the dogs company in the RV. We were reluctantly heading back home the following day. 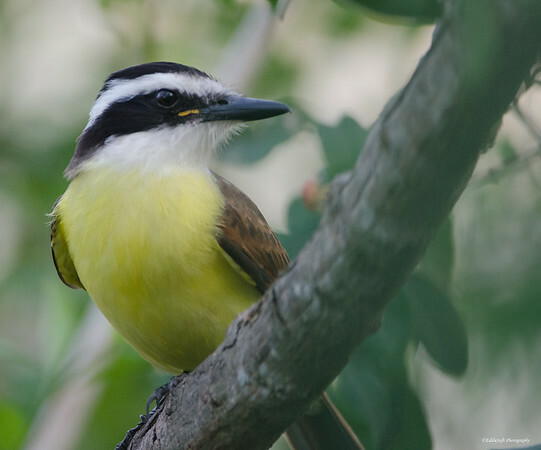 Hit the jump to learn what this new colorful addition to my birding happens to be! Right before heading into the visitor center for the final time, a loud racket erupted from a small tree just off the patio of the center. I was complete unfamiliar with that call which the Peterson reference book documents as a “high penetrating kee-ZEE ick! kee-Zee ick!” with the accompanying auditory image of squeezing a bathroom rubber duckie. For the record, I have never forgotten that association and having now committed the sound to memory due to a number of additional encounters I’d say they nailed it. Not actually seeing a bathtub in the tree, I promptly shut the door and high tailed it down the patio – sorry Linda, I’m gonna be a bit later. As I drew nearer, the duckie stopped squeaking making it difficult to pinpoint the source. 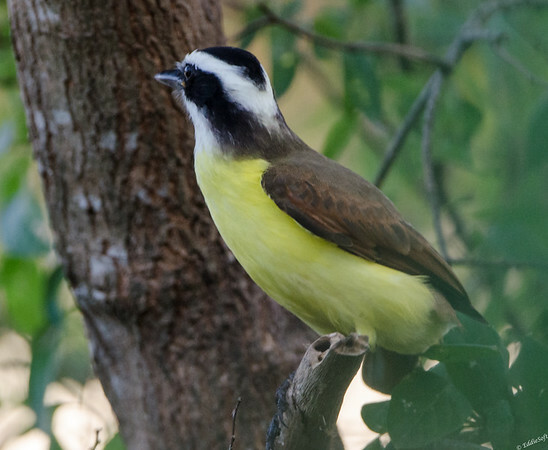 Eventually, this brilliant yellow bellied bird revealed itself. 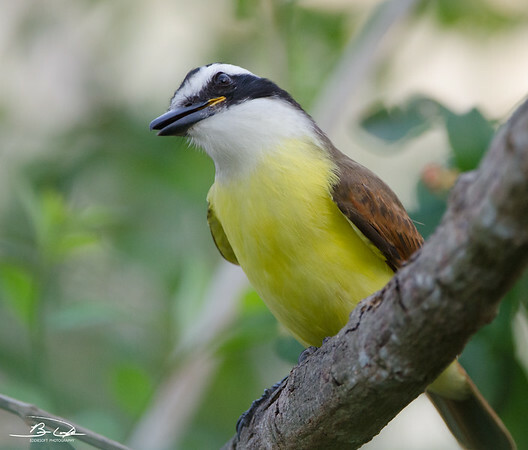 Although I had no idea at the time, a quick check of the reference book in the parking lot informed me this was a Great Kiskadee, which seems fitting since that happens to be Latin for “Water Basin Toy”. Clearly a new +1 on my list and to think without a well timed kee-Zee I would have missed it that trip. I will admit I encountered a large number of these birds on my recent visit to the area over last New Year’s. As I hope other birders will attest, it is never the same excitement as when you discover a bird for the first time. It is on this most recent visit that I had their sound committed to memory. The reference books are correct, these boisterous birds are often heard long before they are seen. They would give a Rooster a run for the money if they had a head to head competition for most obnoxious call. It is truly worth putting yourself through the auditory torture to witness these birds in the wild. 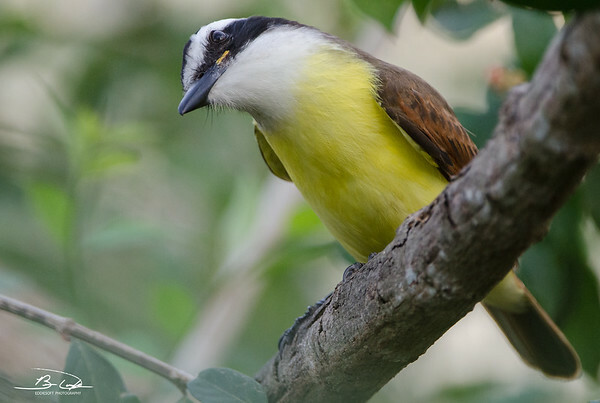 Their bright yellow chest are nicely bordered by the rufous colored wings and tail. They come ready to rob your local bank branch complete with a black mask and stocking cap. If it wasn’t for lacking opposable thumbs they would be holding people up on the streets, shaking them down for watches and insects. Eventually this specimen opted to come out from under the tree branches so I could take a few shots in better light. This was at the cost of it moving further away costing me overall image detail. I might go back into the digital dark room and see if I can boost the colors up a bit on the others. Time for new bird facts. 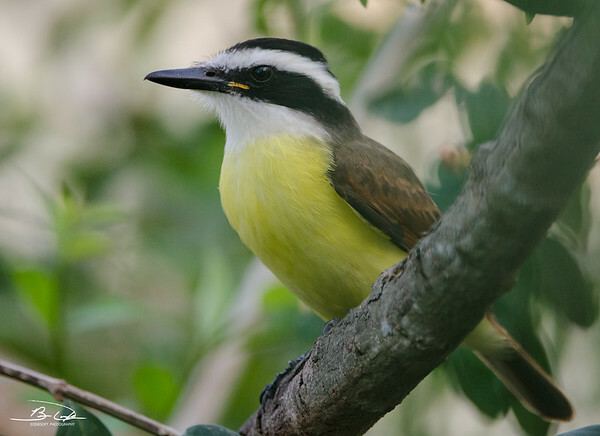 First off, the Great Kiskadee is in the Tyrant Flycatcher family and to no surprise the largest and most self-assured. 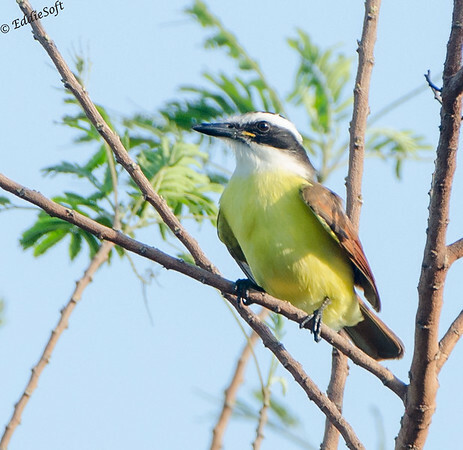 Note it was originally classified as a Shrike around 1766. 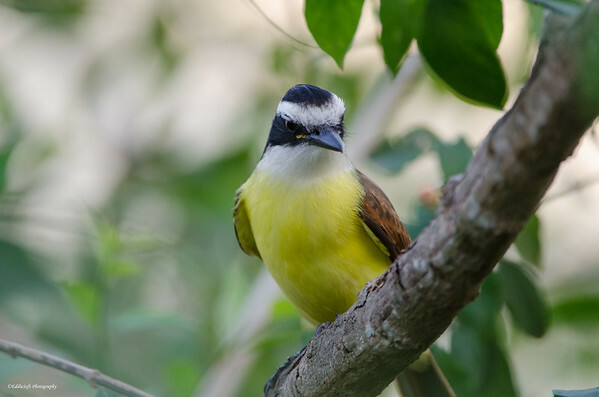 It is definitely a bird that prefers the Central and South American region just reaching up the Texas Gulf Coastline to relish in the Gulf beaches. They also like to hang out with Green Jays which I can completely validate – every time we saw them on this recent trip, they were hanging out with those Jays. Looks like they have been learning from their partners in crime – Cornell mentions the hunt like Fycatchers, fish like Kingfishers, and forage like a Jay – from a skills perspective, the Jay is quite embarrassed of what little it can bring to the table. A small group of Kiskadees had shirts made that read “I befriend a Jay and all I learned was how to pick something off the ground” (in very tiny font of course hehehehe). … and for my brother, another angle to get a good feel of their head coloring and the solid rufous wings.